Recently I was at a crossroad in the development process of Dungeon Scroller & its game mechanics (combat, loot etc). This blog post was a way of putting my ideas & thought processes into words and structuring the way forward! I don’t think any of the above is incompatible, but I need to strike the right balance between fun & complexity. Challenge accepted! Since I started this project, my approach has been to cautiously implement new systems and build content incrementally as the game takes shape. 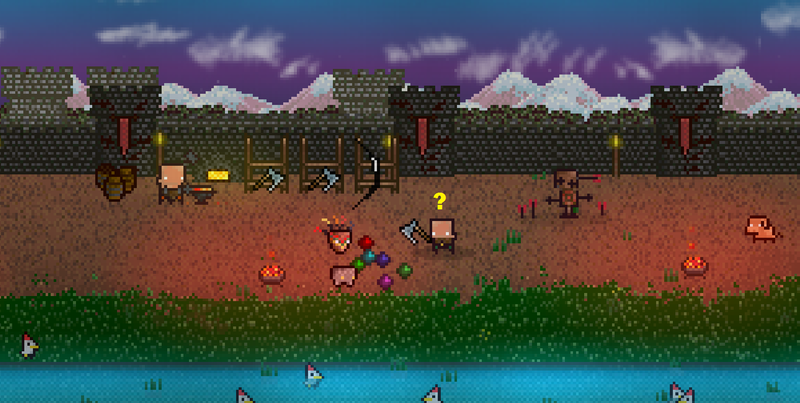 Dungeon Scroller already has a working loot system, hero upgrades & combat mechanics. Combat is currently about dodging and attacking. Depending on the weapon equipped by the hero, attacks are either close or long range. The same goes for the enemies: there are only two types for now – ranged and close. Weapon drops correspond to the class being played, e.g. barbarian. The game needs to have enough weapons coded so that the same ones don’t keep on dropping. For a barbarian, this means the game needs to have a range of weapons of increasing power. Low levels drops could be clubs, maces, short swords, daggers and whatnot. High level ones would be great swords, war hammers etc. Every class in the game needs to have a large number of choices to maintain some feeling of randomness. Ultimately most weapons would end up very similar to each other. Weapon drops do not match the class being played. E.g. the barbarian might get a bow as a drop, a weapon he cannot use. This then calls for inventory management, so that the weapons can be sold or stored somewhere to be picked up by the relevant class. Players might get frustrated for not getting drops relevant to the class they are playing. Also, should weapons be dropped for classes that haven’t been unlocked yet? If you add magic into the mix (i.e. drop weapons with magical properties), things can easily become very complex. Magic would increase the number of possible drop combinations, players might get frustrated they get the wrong drop combos, which could only be addressed by adding a shop in the game to exchange unlucky drops for weapons the player really wants. More coding to do! Limited & class specific range of weapons: each class has three weapons to choose from. Each class & weapon combo will be very distinct and promote different gameplay styles. They will also have to be unlocked, which contributes to the reward system and motivate players. Magic is a separate system, working in parallel: weapons do not have magic properties. Instead, touchstones are dropped by monsters and can be “equipped” by the player. Equipped touchstones provide bonuses, and are not bound to weapons or classes. Since touchstones can be used by all classes, this removes the combinations dilemma & balancing issues! The system is simple enough for casual play (since touchstones are shared by all heroes, the player can come up with interchangeable combat strategies). This lays the core foundations of the game mechanics. Now let’s spend a bit more time on touchstones! I originally wanted to use gems for Dungeon Scroller’s magic system. This is what they are called in Diablo II, where they are a keystone to the loot system & game mechanics – the player can tweak his/her arsenal by slotting gems onto his gear. However, I am prejudiced against the word “gem”: on the mobile market it is usually associated with in-app purchases! I have no intention of releasing Dungeon Scroller as a freemium game (or to be considered one), so have decided to dissociate from the word gem altogether. Touch Stone has a nice ring to it, so I went for that term instead. Depending on where on the belt they are equipped, they provide either offensive or defensive bonus. This is similar to Diablo where gems would boost depending on whether they were attached to armour or weapons. Unlike Gems in Diablo, Touch Stones are not bound to weapons or armour – they can be equipped and un-equipped as the player wants. No horadric cube, although I do plan to allow players to merge stones to increase their bonus! My hope is that touchstones will enhance the gameplay, b y adding variety to hero builds available to players. To make combat more interesting I plan to code elemental defense/resistance to monsters, forcing the player to tailor his equipment accordingly. Past the first few levels, monsters will start to have strong resistance to physical attacks, and also deal magic damage. Since touch stones are interchangeable, the player will always be able to adapt his arsenal. Entering a new dungeon later in the game will also require some trial & error on what combination of touchstones works or not – hopefully keeping players on their toes! Trinkets are another way to spice up the game play. Where touch stones follow a structure (defensive & offensive powers depending on where they are equipped) trinkets can pair up to three different powers & bonuses. Caveat: only one trinket can be equipped at a time, and some might provide a bonus for a given stat but a malus for another. Trinkets will be visible on the hero, i.e. a skeleton mask will appear on the hero’s face! 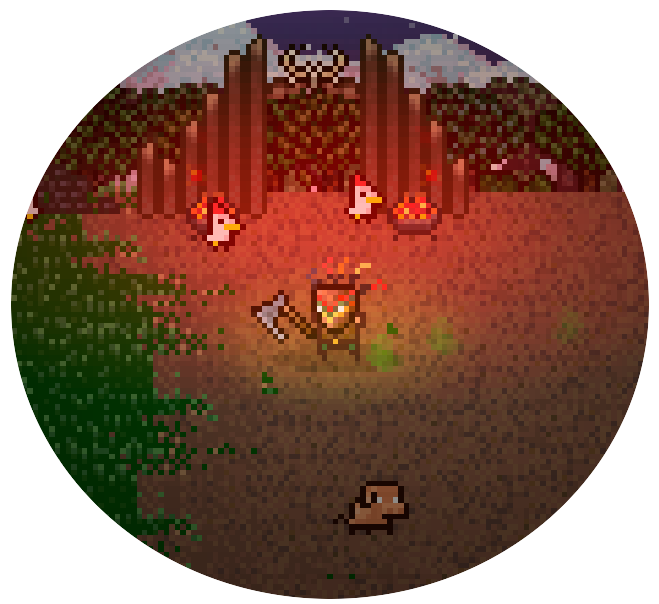 I still need to figure out how trinkets will be integrated in the loot system, but that’s something for later! Writing on this topic was very useful – shortly after starting the post, I revamped the whole inventory system! Putting my ideas in writing certainly helped me work out the key points I was targeting with Dungeon Scroller. It also made me revisit past decisions. My original intention was not to implement trinkets – I wanted to keep the mechanics lean and coding simple. However, I realised that since I was implementing magic to make the gameplay richer, once the touchstones structure is in place I might as well go all in! As usual, feel free to leave a comment below!